With the creation of the Dominion of Canada in 1867, the central government assumed responsibility for money and banking, as mandated under section 91 of the British North America Act, and it undertook to standardize the fledgling country's currency. 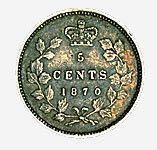 Ottawa issued a new series of coins in denominations of 1, 5, 10, 25 and 50 cents (similar to the 1870 5-cent coin shown here). They were legal tender in the four provinces that signed the 1867 Confederation pact (Ontario, Quebec, New Brunswick and Nova Scotia) and later in all provinces that subsequently joined the Dominion.